Sandy bought a Tofurky, which I hadn't ever tried before. It was pretty good actually. Maybe not my favorite thing in the whole world, but not so bad either! I particularly liked the stuffing. She also cooked it with some carrots and onions, which were quite delicious! 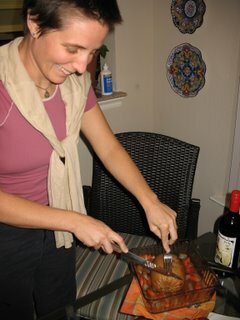 Here's me carving the Tofurky! Hee hee. It was kinda fun. After all those years of watching other people carve turkeys, it was fun to carve a Tofurkey. There was a turkey too, but I didn't take a picture of that - for obvious reasons! :) Sandy also made some delicious roasted veggies that were super good, but I forgot to take a picture of them. 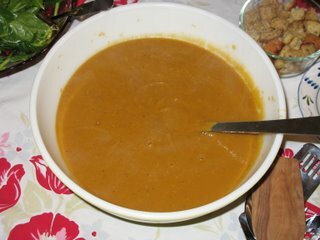 I made this great soup for the party too... It's the "Creamy Pumpkin Chestnut Soup" from "The Modern Vegetarian Kitchen." It's really good! It's flavored with onion, garlic, rosemary, cinnamon, and sage. I really, really loved it. The only problem was that the peeling the chestnuts is a huge pain in the behind. It took forever & it was so hard, even though I scored them with the "x" before boiling them. Did I do something wrong? Please don't be bored with me! 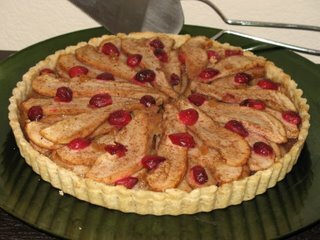 I made another one of the "Pear Cranberry Tarts" from VwaV. Unfortunately it wasn't nearly as good as the last one I made, because the pears weren't as ripe. 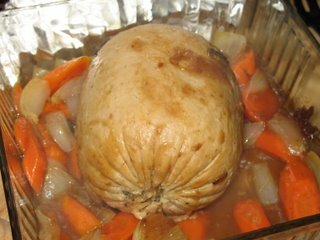 I am planning on making this again for the Thanksviging, but I'm going to buy my pears tomorrow in order to give them enough time to ripen up. It made a big difference. Also, my super cool friend Kristy brought two pies - including this outstanding vegan apple pie. It was so insanely delicious! There was one piece left, and she gave it to me to take home. I'm so grateful for such wonderful friends. Sounds like you have some terrific friends who really support veganism! Glad you had a nice celebration. How did your meeting on Friday go with the sandwich shop owner? Yeah, I was feeling so glad to have such nice friends. :) Also, thanks for asking about my sandwich meeting!! I think you saw, but if anyone else is interested, I replied in the comment to that post. It went really well! 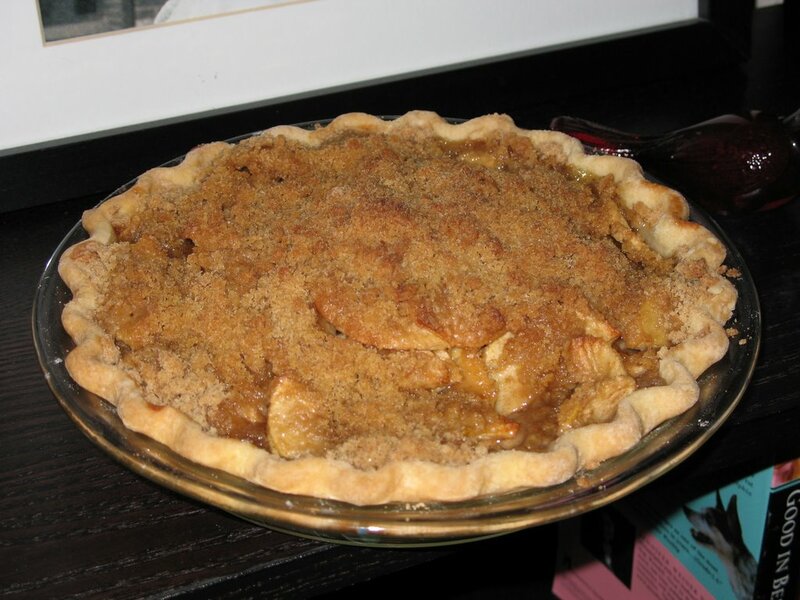 It's my first time over to your blog and I just wanted to say that those pies look totally beautiful and delicious ! And your Roasted Cauliflower with Lemon-Tahini Dressing looks totally awesome ! What beautiful colors ! I've never actually seen a tofurkey out of the packaging. Funny looking things, aren't they? At least they don't shape them like turkeys...that would be too weird. Are you kidding me...you can post pictures of those tarts anytime and i'll be happy. Looks incredible even if the pears weren't quite right. I've never seen tofurky out of the box either. I would be perfectly happy with the veggies, soup, and pies! That pear tart is so beautiful! I really really want to bake one. You do indeed have great friends! Thanks for stopping by and leaving a comment! :) Yeah, I couldn't believe how those cauliflowers kept their pretty colors. Hee hee, I know it... the Tofurkey is funny looking! A weird little loaf of tastiness. And also - I agree that it's a good thing that they aren't shaped like turkey! Thanks for the support about the tart - I felt boring posting the same thing twice in such a short time!